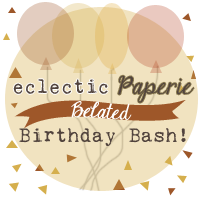 Welcome to eclectic Paperie's Belated Birthday Bash! Today we're celebrating the (belated) one year anniversary of the store's new ownership! It's been an amazing year, full of inspiring projects, wonderful classes, and many, many new products!! eclectic Paperie wouldn't be where it is today without the ongoing support of our customers and as a BIG thank you you'll have an opportunity to lots of great prizes! eclectic Paperie will be giving away the following prizes to five commenters! You have until midnight EST tomorrow (9/20) to comment. To be entered into the prize drawing, please be sure to comment on the eclectic Paperie blog and on each of the eTeam blogs. Check out all of the thumbnail links below to view the rest of the projects from the eTeam, past eTeam members, previous guests, and blessed friends!! Enjoy the hop! Cool - thanks for a chance to win!! Happy B'day! Thanks for all the wonderful inspiration and great challenges. What a great accomplishment! Congratulations! Happy Birthday! Thanks for posting all the fantastic blogs. Congratulations! Thank you for a chance to win! Happy Birthday and thank you for the opportunity to win some great prizes! Happy Birthday - having fun seeing everyone's projects. Thank you for the chance to see fun projects and the chance to win! Congrats on your belated birthday--off to hop and be inspired. Congratulations on your First Birthday, Kim! Just off to do the Hop! Happy birthday! i am so glad I found your blog a while ago! So many nice tips and tricks I find here every time I come by. Happy B'day! I love receiving an order from you and I love the little extra surprise you always include. It makes me feel like a special customer. Keep up the good work! Just finished the blog hop, great inspiration, thanks so much! Fabulous! Thanks for the chance to win some awesome goodies. Happy Belated Birthday eclectic Paperie. Thanks for all the inspiration. happy belated anniversary! so exciting! Thanks for the blog hop! All of the art was excellent! Happy anniversary and I hope you have many, many more! Love what I've seen on the blog hops thus far...off to drool some more! i love the bold color of the flower and your use of gelatos. i've played with gelatos a bit and noticed a little goes a long way. i like to add water directly to images close together, then wipe them off a bit revealing fun space beneath to rework. i'm thinking about the use of stencils in my white spaces...hmmmm... thanks for sharing your card! Happy Be-lated Birthday/Anniversary!!! The blog hop has been amazing and so inspiring. So many things I want to try. Thank you for that. I wish you many more years to come!!! Thanks Tammy for sending me here. So much to check out on this great site. Off to start a new adventure. Fantastic blog hop, so much inspiration! This was a great blog hop! Happy happy happy 1 year!!! Congrats! Happy B-day!Time to celebrate! Great idea for a hop! Great blog hop, I saw a lot of new work. Thanks for the chance to win! Happy Birthday oh deserving one! I just finished the blog hop and each one is so very talented. Amazing cards, tags, and projects. Loved every single one. Happy Birthday! Thanks for a great hop! Saw some really wonderful things! Happy Birthday !!! I've just found you and i look forward to alot of fun and inspiration! Happy Birthday, loads of inspiration and thanks for your generosity ! Congrats on your first year, Kim!!!!!!!!!!!! And what a fabulous prize!!!!!!!!! Keeping my fingers crossed. Congratulations on your one year anniversary! Fabulous prize! Happy 1st Birthday to you! Love a party where there are surprises (blogs to visit) and prizes (opportunity to win goodies)! Mom always taught me to thank the host or hostess when I go to a party... so thank for an awesome Hop and for the opportunity to win prizes and more importantly for a year of fun and inspiration! Belated birthday wishes to all! So sorry I couldn't join in with the hop... you've all done wonders as usual! Happy birthday Eclectic Paperie. Wow this year has blown by! I love your shop and have purchased many fun things in the last year. May you have many more happy, successful years ahead. Happy Birthday EP! This is so inspiring! Congrats to EP on the one-year birthday celebration! Looking forward to checking out the hop! Lots of talent and inspiration without a doubt! Happy Birthday. I thoroughly enjoyed the hop. Thank you for the chance to win such a fabulous prize. Happy Birthday and congratulations!!! Thanks for the chance to win some awesome products. You are doing a wonderful job.as new owner Kim!!! There are so beautiful projects here! Thanks for the chance to win and a BIG Happy Birthday! Happy Birthday! Always inspiration at EP! Gotta hop now! Kim - you truly provide the best customer service! Happy Birthday. Thanks for a chance to win. September is a good month ... I just celebrated a birthday too! Wow, happy belated birthday. Great projects by everyone. Thanks for the chance to win this fabulous prize. Such an amazing prize, thanks so much for the chance to win!! So many fabulous projects. Congrats on your anniversary. Thanks for a chance to win some awesome prizes. Happy Belated Birthday! Thank you for a chance to win a wonderful gift from your shop even when it's your celebration, yay!! Happy Birthday your belated blog hop is wonderful. I'm impressed by the work that each and every one of the bloggers has created and have definitely been inspired by you all. Great hop, and fab prizes on offer! Happy Birthday! Happy Birthday ! Better late than ... even later ! Gelukkige Verjaardag (= in Dutch) ! Happy Birthday, and thanks for the blog hop and the awesome prizes! It's so much fun to visit all the participating blogs! Happy Birthday to you and many happy returns too. Thanks so much for the opportunity to win one of your fabulous prizes! Had a great time on this Belated Birthday Bash Blog Hop :) thank you so much for the opportunity to win and HAPPY BIRTHDAY!! Congratulations! Thank you so much for this chance to win! I look forward to your email every evening..
Keep up the good work showing out of the box projects with old and new techniques alike..
Wishing you many happy returns..
Just finished hopping and all I can say is WOW! What amazing talent and inspiration! Happy 1st birthday and to many more! I left a comment when I first started the hop, but I'd like to add another now that I've finished "hopping." WOW! May I say it again? WOW! I have never enjoyed a hop as much as I did today. I took the afternoon to go through all the cards and tags and mixed media projects and I am overwhelmed. Some were just fun, some were a little intimidating, but all were well explained and I have learned so much. What an amazing group of talented artists. Thank you so much for sponsoring the blog hop, and Happy Birthday! Wow....such wonderful birthday gifts you are sharing! I'd love to have a piece of those. Yum!! That was such a fun blog hop! I plan to return to some of the blogs too. I am truly inspired!